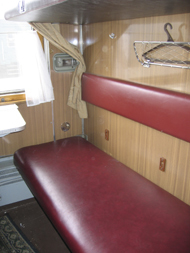 The train 5 has 2nd class compartments and a restaurant wagon. This train is unique because it is frequently filled with Russian and Mongolian traders with their goods. The police may also make more careful inspection of the compartments due to the high trade activity. Usually it takes 4 hours, so be ready to spend some time at the train station Naushki (Russia - Mongolia border). International train 5 (Ulaanbaatar - Moscow) departure from Ulaanbaatar twice a week on Tuesdays and Fridays (13:50, Local time). Accordingly this train arrives to Moscow on Saturdays and Tuesdays (14:28, Moscow time). Поезд 005 Улан-Батор - Москва. маршрут. Стоимость билетов.